Today we have received confirmation from Vuzix CEO Paul Travers that the highly anticipated Vuzix Wrap 920, previously known as the AV920 Wrap, will not, in fact, be a see-through head-mounted display (HMD). It will instead be a “see-around” model. This means that the LCD viewing elements will be opaque, as in previous models, but will be suspended behind a sunglasses-style lens without obstructing the peripheral view around the display. There is a pile of reasons that the Wrap series will be using this rather than “see thru”. Looks nice and seems to be light-weight. Cool! However, it shares the narrow field of view with most of its predecessors. It they sell it for a good price, it could become a success! They are going to loose ground to the Japanese competitors it seems. Its very bad form to change such a major spec of a device like this while keeping the name too. It means it riding on a wave of false hype. Its weird, I dont quite understand what so hard about making a transparent display anyway. They wernt aiming to do blacks, just positive/adative overlays….surely you just need a TOLED screen? They exist already, they are in use. Maybe a 640×480 one would be too expensive at that small size, but that dosnt seem like a tone of reasons. Theres of course focusing issues etc….but I dont think thats moreso then having an inset screen. Oh well. While some researchers are slaving away at context lens, its depressing we cant get something like this onto the market. And is *ANYONE* even looking at side-projection? It always seemed like a good option to me. (allthough, again, it couldnt do blacks). I am a regular user of video eyewear and have AV920 and VR920 units from Vuzix in my arsenal as the best and most used. Lately I am shifting much more to the AV920 because of all the content and ease of access to it on iPhone. So this AR thing is likewise about applications, content and connectivity, and although Android and iPhone lead the way, there is no connectivity for applications to port out to eyewear, although the apps and content side seems to be filling in nicely. Personal AR is about mobility, so when will there be devices with connectivity to eyewear? 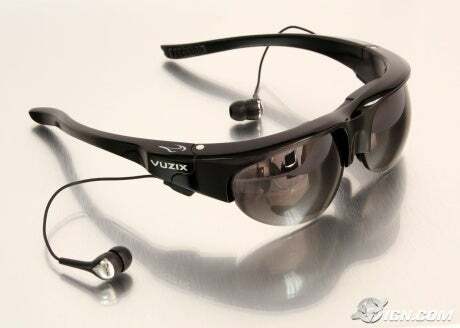 Although I am confident Vuzix can produce see-through stuff (they do it for the military), I say, keep making better looking and higher resolution immersive glasses until the market is there for AR in the consumer space. You wont get any applications supporting hardware untill the hardware is out. The hardware needs to come first. Vuzix simply needs to create a standard API that developers will support. Since they (could) have been the first major HMD AR system, it would have easily got the support too. Theres a lot of major companys, tourist attractions, engineers and universitys all using custom/self-built HMD hardware. Theres a massive market for mass produced AR even before it gets to the “average joe” market. They shouldnt need more then miniusb hardware wise at current resolutions anyway, so the hardware is no limitation there. (allthough, obviously, Apple might well be a pain if they have it all closed as restricted). Not sure what you are referring to, but I mean simple video out so whatever id on the screen can be seen in the glasses superimposed with the AR info. None of the Android handsets have it even for watching movies on eyewear, TV at home, Pico projectors, anything – Why? iPhone has video out when watching video stored or streaming via the onboard player, but doesn’t allow the screen to be shipped out the same connection. Why, I don’t know. Promised for future s/w releases, but hasn’t happened yet. If apple turns this on, they will take the AR market by storm as people and Vuzix and others will rush their see-through products out pretty fast. So the chicken and egg situation is the other way around. This feature is not just driven by AR! Apple, Nokia, LG, Samsung, HTC, Blackberry, Sony Ericsson and others all have TV/Video out capability and cables now for watching video and pictures. Why none on Android? If it supports rich media, people will want to watch it anywhere anytime on the biggest screen they can find. Just like music and earbuds, speakers or big stereo rigs from a tiny nano! You dont want a standard video-out, as that wont support stero video. It also wont support the necessity for a custom-data format that will probably be required to get opacity. (RGBA ideally, although thats a few years away from being a hardware possibility on HMD). More importantly, you can send other data (like the cameras input) back over it too. Augmented Reality wont work without data coming back to align stuff. (you could always mount your iPhone onto the HMD, but thats going to wreck any “sleak” design your going for). (Vuzixs solution at the moment, remember, has a modular camera clipped to the top of the glass’s…data from that has to go back to the device). So data *needs* to flow both ways. Of course, usb isnt perfect as it has data limits. But I dought we will be pushing against them at current resolutions. No, we need decent HMDs on the market. Make them work with anything that has a usb port, then let people release software for them (ie, open APIs to access the screens). Phone support will come by itself then. I just stumbled accross your post via Bing. I just love the layout and the content are extremely well prepared. I just subscribed to your rss feed. The processor is tagged as just a bit more recent model number but it and also the GPU are most likely the same pace since the 3GS. The old Touch using the same Processor and GPU since the 3G was faster. Besides getting the clock speed turned up higher the Contact has much less software to run because it is not a telephone. It should do more than any iPhone to day in overall performance.